Infosys Poland Sp. z o.o. 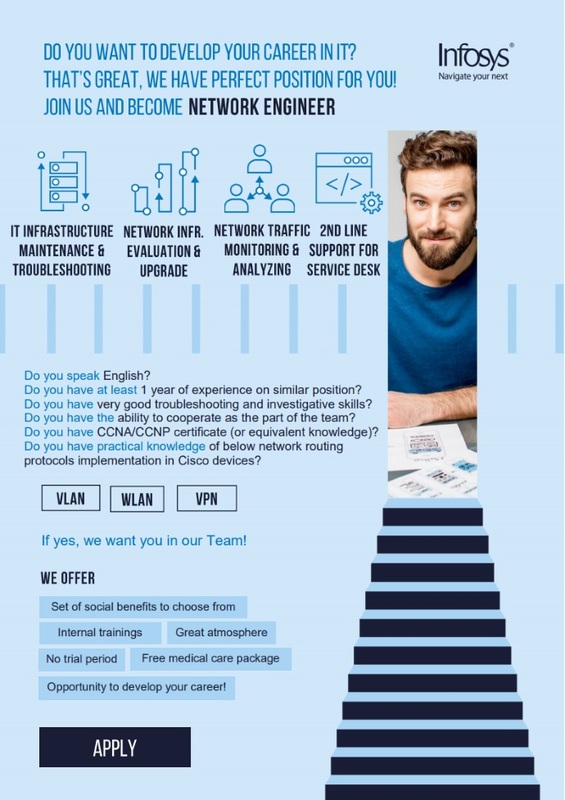 DO YOU WANT TO DEVELOP YOUR CAREER IN IT? THAT’S GREAT, WE HAVE PERFECT POSITION FOR YOU! Do you have at least 1 year of experience on similar position? Do you have very good troubleshooting and investigative skills? Do you have the ability to cooperate as the part of the team? Do you have CCNA/CCNP certificate (or equivalent knowledge)? Do you have practical knowledge of below network routing protocols implementation in Cisco devices? If yes, we want you in our Team! Opportunity to develop your career!